A $35 million project is underway at Monticello to recreate or restore spaces where Thomas Jefferson's salves worked and lived. 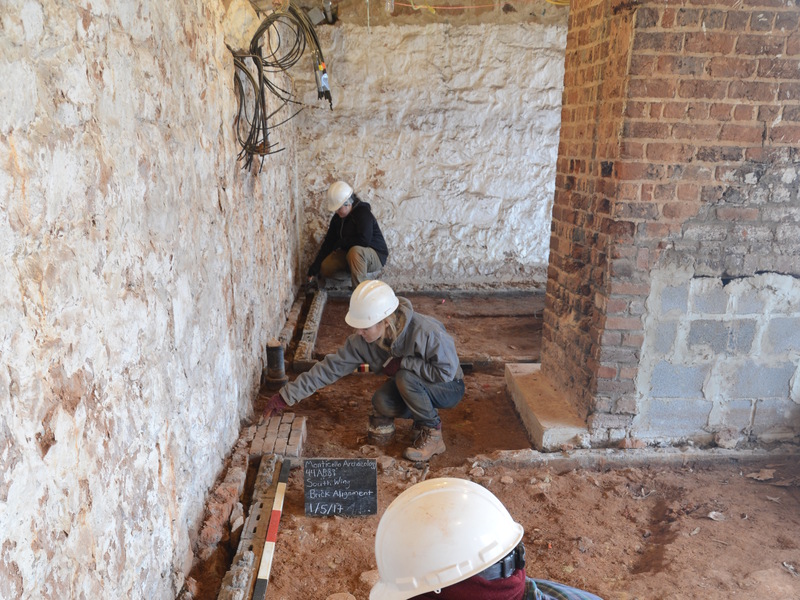 Archaeologists uncover the original brick floor of what is believed to be Sally Hemings' living quarters at Monticello. Thomas Jefferson wrote the famous words "all men are created equal," but he also owned more than 600 slaves over the course of his life. His Virginia plantation called Monticello is being renovated to shed more light on the enslaved people who lived and worked there. One of the most notable of those slaves was Sally Hemings. Jefferson is widely believed to have fathered her six children. The museum is working to restore a restroom believed to be Hemings&apos; living quarters. "Sally Hemings has been hugely important in the American imagination for over 200 years. But mostly she&apos;s seen through Jefferson, and I think we wanted to, for the first time, devote a space that&apos;s just about her," Christa Dierksheide, a historian for the Thomas Jefferson Foundation at Monticello, tells NPR&apos;s Ari Shapiro. "That&apos;s seeing her as a person, as a mother, as a sister, as a daughter." Through the restoration process, archaeologists have discovered what may have been Hemings&apos; fireplace, the original brick floor and even traces of some shelves. Dierksheide explains that Hemings&apos; story was excluded from the history of Monticello until the 1990s because it was viewed as something that could taint Jefferson&apos;s reputation. Dierksheide also says there is much we still don&apos;t know about their nearly 40-year relationship. "One of the things that visitors are surprised to learn is that she and Jefferson&apos;s wife, Martha, shared the same father, the slave trader John Wayles," Dierksheide says. "So that actually made Jefferson&apos;s wife and Sally Hemings half-sisters." Dierksheide says along with shedding more light on Hemings&apos; story, the goal of the $35 million project is to restore the landscape of slavery at Monticello. "What we realized is that even though we were telling the story of slavery on the mountaintop — the area of the house — nobody could actually see anything visible," Dierksheide says. "There were no remnants of slavery that visitors could encounter. ... And we&apos;re recreating or restoring spaces where enslaved families would&apos;ve worked, would&apos;ve lived, and made it the dynamic place that it was."